Over 500 varieties of PERENNIAL PLANTS are available in spring and summer at Homewood including coreopsis, daylilies, bleeding hearts, coneflower, heuchera, elephant ears, sages, hostas, ferns, ornamental grasses, hardy hibiscus, verbena, lantana, and many more! 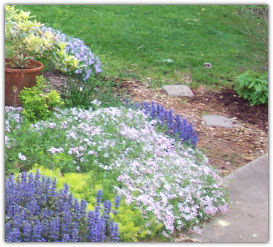 GROUNDCOVERS are an essential part of today's low-maintenance landscapes. Homewood carries groundcovers that are well-suited for our Carolina climate. They are available in flats and/or individual pots. 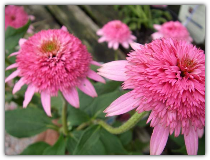 We offer many varieties including the popular Stepables line, sedums, ajuga, pachysandra, vinca, ivy, dwarf mondo grass, liriope, moss phlox, juniper, and more. 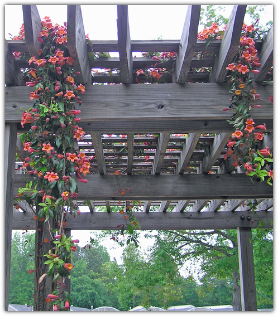 VINES add vertical interest to landscapes and can be used to hide unattractive features of the home. You'll find both evergreen and deciduous, hardy vines in the outdoor Nursery Dept. and tropical or annual vines such as mandevilla and morning glory in our greenhouses.